Bu araştırmanın amacı; buğdayın yüzey artıklarıyla kaplı tarla koşulunda cetvel yöntemi, kesişen hat yöntemi, ImageJ görüntü işleme programı ve Labview Vision Assistant Modülüyle yüzey artığı kaplama yüzdesinin belirlenmesi ve elde edilen sonuçların karşılaştırılmasıdır. ImageJ görüntü işleme programı ve Labview Vision Assistant Modülüyle yüzey artığı kaplama yüzdesinin belirlenmesi için, buğday yüzey artıklarıyla kaplı bir tarlanın çeşitli yerlerinden akıllı cep telefonunun dijital kamerasıyla fotoğraflar çekilmiştir. Araştırma sonunda; cetvel, kesişen hat, ImageJ görüntü işleme programı ve Labview Vision Assistant Modülü kullanılarak ortalama bitki yüzey artığı kaplama yüzdeleri sırasıyla % 44.13, % 50.72, % 56.56 ve % 64.49 olarak belirlenmiştir. Yapılan varyans analizi; kesişen hat ve ImageJ görüntü işleme yöntemlerinden bulunan sonuçlar arasındaki farklılığın istatistiksel olarak önemsiz, bu yöntemlerle diğer yöntemlerden elde edilen sonuçlar arasındaki farklılıkların ise önemli olduğunu göstermiştir. The purpose of this research was to determine the percent crop residue cover using meter stick method, line transect method, image processing software ImageJ and Labview Vision Assistant Module in the field condition covered with wheat surface residues and to compare results obtained from these measuring methods. In order to determine the percent crop residue cover using ImageJ image processing software and Labview Vision Assistant Module, photographs were taken with a digital camera of the intelligent mobile phone from various places of a field covered with wheat surface residues. At the end of study, the mean percent crop residue cover using meter stick method, line transect method, image processing software ImageJ and Labview Vision Assistant Module were determined as 44.13%, 50.72%, 56.56% and 64.49%, respectively. Variance analysis showed that the difference between the results obtained from the line transect method and ImageJ is statistically insignificant while the differences between the results obtained from these methods and the other methods are significant. Aase JK, Tanaka DL (1991). Reflectance from four wheat residues cover densities as influenced by three soil backgrounds. Agronomy Journal, 83: 753-757. Al-Kaisi M, Hanna M (2009). Residue Management & Cultural Practices. Resources Conservation Practices, PM 1901a, University Extension, Iowa State University, Iowa. Anonim (2016). Labview Nedir? http://mekatronikdersi.blogspot.com.tr/2014/10/ labview-nedir.html. (Erişim Tarihi: 07 Şubat, 2016). Anonymous (2015). Estimating Crop Residue Cover for Soil Erosion Control. Soil Factsheet, Order No: 641.220-1, revised December 2015, Created September 2000, British Columbia, Ministry of Agriculture, Abbotsford, British Columbia. Anonymous (2016a). Reduce Need. Agricultural Irrigation Management: Reduce the Need for Irrigation: Maintain Crop Residue, Reduce Tillage. University of Nebraska-Lincoln, UNL Water, http://water.unl.edu/cropswater/reduceneed. (Erişim Tarihi: 08 Nisan, 2016). Anonymous (2016b). Crop Residue Estimator. FieldTRAKS Solutions 2016, http://fieldtraks.ca/prod_cropresidue.html. (Erişim Tarihi: 04 Ağustos, 2016). Bannari A, Pacheco A, Staenz K, McNairn H, Omari K (2006). Estimating and mapping crop residues cover on agricultural lands using hyperspectral and IKONOS data. Remote Sensing of Environment, 104: 447-459. Corak SJ, Kaspar TC, Meek DW (1993). Evaluating methods for measuring residue cover. Journal of Soil and Water Conservation, 48 (1): 70-74. Daughtry CST, McMurtey III JE, Kim MS, Chappelle EW (1997). Estimating crop residue cover by blue fluorescence imaging. Remote Sensing of Environment, 60: 14-21. Daughtry CST (2001). Estimating Crop Residue Cover by Remote Sensing. Hydrology and Remote Sensing Lab. USDA-BARC-ARS. Daughtry CST, Doraiswamy PC, Hunt Jr ER, Stern AJ, McMurtrey III JE, Prueger JH (2006). Remote sensing of crop residue cover and soil tillage intensity. Soil & Tillage Research, 91 (2006): 101-108. Dickey EC., Harlan, PW, Vokal D (1981). Crop residue management for water erosion control. University of Nebraska-Lincoln, DigitalCommons @ University of Nebraska-Lincoln, Biological Systems Engineering: Papers and Publications, G18-544, 4-1-1981, Nebraska. Dickey EC, Havlin J (1985). Estimating Crop Residue Using Residue to Help Control Wind and Water Erosion. University of Nebraska-Lincoln, Biological Systems Engineering, Lincoln, NE Leaft No: 3, 1-1-1985, Nebraska. Dickey EC, Shelton DP, Jasa PJ (1986). Residue Management for Soil Erosion Control. University of Nebraska-Lincoln, Lincoln Extension, G18-544, 1-1-1981, Nebraska. Dursun Göknur İ (2002). Bitki yüzey artığı kaplama oranının belirlenmesinde kullanılan yöntemler. Türk-Koop Ekin Dergisi, Yıl: 6, Sayı: 21, s. 60-65, Ankara. Dursun İ (2015). Toprak İşleme Alet ve Makinaları. Ankara Üniversitesi Basımevi, Ankara Üniversitesi Ziraat Fakültesi, Yayın No: 1618, Ders Kitabı: 570, 584 s., Ankara. Hickman JS, Schoenberger DL (1989). Estimating Wheat Residue. Cooperative Extension Service, L-783, Crops and Soils 4-5 (Soil Conservation), Manhattan, Kansas. Karabacak H (2007). Bitki Yüzey Artığı Kaplama Oranının Görüntü İşleme Tekniğiyle Belirlenmesi. Ankara Üniversitesi, Fen Bilimleri Enstitüsü, Tarım Makinaları Anabilim Dalı, Yayımlanmamış Yüksek Lisans Tezi, 66 s., Ankara. Laflen JM, Amemiya M, Hintz EA (1981). Measuring crop residue cover. Soil and Water Conservation Society, Journal of Soil and Water Conservation, 36 (6): 341-343. McMurtrey III JE, Chappelle EW, Daughtry CST, Kirn MS (1993). Fluorescence and reflectance of crop residue and soil. ]. Soil Water Conserv. 48: 207-213. Meyer GE, Stepanek A, Shelton DP, Dickey EC (1988). Electronic image analysis of crop residue cover on soil. Transactions of ASAE, 31 (2): 968-973. Morrison JE, Chichester FW (1991). Still video image analysis of crop residue soil covers. Transactions of the ASAE, 34 (6): 2469-2474. Presley D (2013). Estimating Crop Residue Cover. 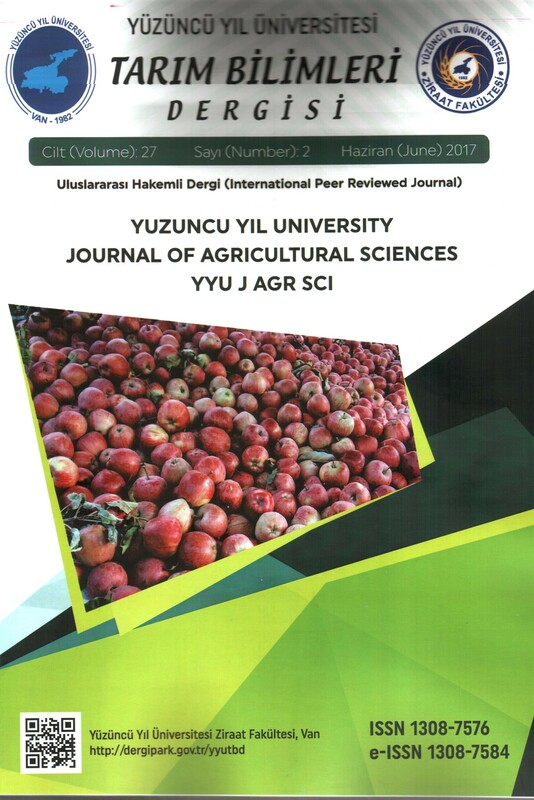 K-State Agronomy eUpdates, Sayı: 426, K-State Research and Extension, Manhatan. Rice CW (2002). Storing Carbon in Soil: Why and how? Geotimes (2002), pp. 1-5. Shelton D, Jasa PJ (1995). Estimating Percent Residue Cover Using the Photo-Comparison Method. G95-1134, 1-1-1995, Field Crops, H-3, Conservation and Management, University of Nebraska, Nebraska. Shelton D, Jasa PJ (2009). Estimating Percent Residue Cover Using the Line-Transect Method. G1931, Nebraska Extension, NebGuide, Conservation and Management, University of Nebraska, Nebraska. Shelton D, Smith JA, Jasa PJ, Kanable R (1995). Estimating Percent Residue Cover Using the Calculation Method. G05-1135-A, Field Crops, H-4, Conservation and Management, University of Nebraska, Nebraska. Streck NA, Rundquist D, Connot J (2002). Estimating residual wheat dry matter from remote sensing measurements. Photogrammetric Engineering & Remote Sensing, 68 (11): 1193-1201. Wysocki D (1988). Measuring Residue Cover. PNW Conservation Tillage Handbook Series, Chapter 3-Residue Management, No: 9. Zheng B, Campbell JB, Serbin G, Galbraith JM (2014). Remote sensing of crop residue and tillage practices: Present capabilities and future prospects. Soil & Tillage Research, 138: 26-34.